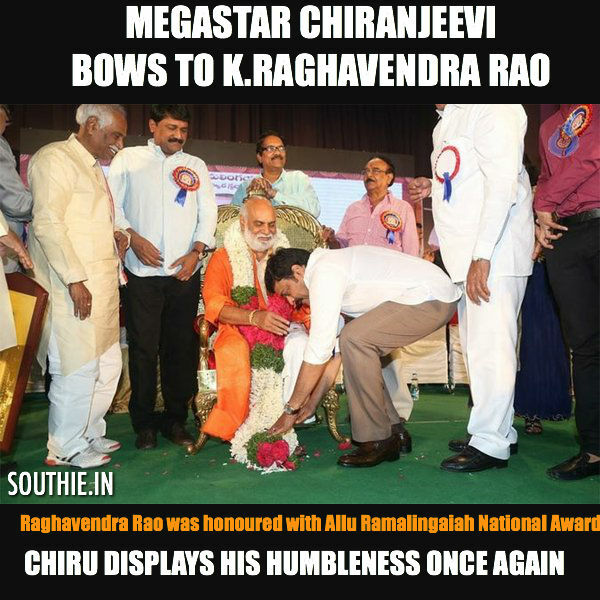 The Humble Megastar Chiranjeevi honours K.Raghavendra Rao. Home/NEWS/The Humble Megastar Chiranjeevi honours K.Raghavendra Rao. The Humble Megastar Chiranjeevi honours K.Raghavendra Rao. Chiranjeevi humbles himself after presenting the Allu Ramalingaiah national award. Chiranjeevi, Allu Arvind, Allu Arjun and many other prominent people are present while facilitating K.Raghavendra Rao. Veteran filmmaker K Raghavendra Rao (KRR) was honoured with Allu Ramalingaiah Kalapeetam Award, for his contribution to Indian cinema, at a glittering function here on Wednesday. The award ceremony provided an opportunity for several personalities from various walks of life to wax eloquent about the achievements of the director and also remembered Allu Ramalingaiah’s unparalleled contribution to the Telugu film industry. Chiranjeevi, actor and son-in-law of Allu Ramalingaiah said, “Like everyone, even I’m also a big fan of Allu Ramalingaiah before coming into films but I learnt a lot personally and was inspired after seeing him from close quarters.